Nel Jayaraman followed the footsteps of his late mentor Nammalvar and worked tirelessly to promote the cause of preserving native paddy seeds. 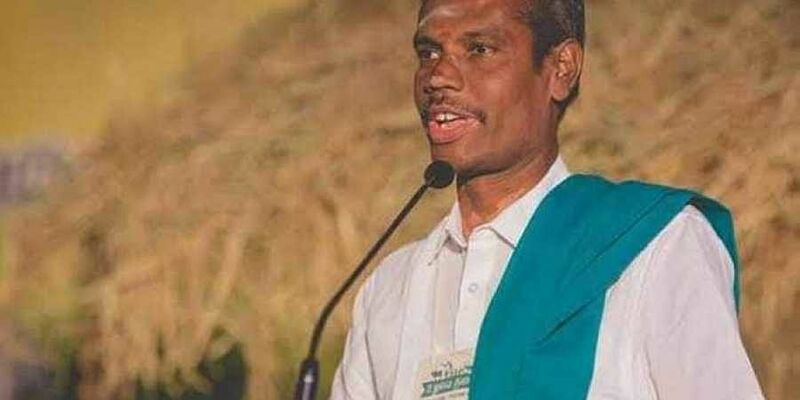 CHENNAI: 'Nel' Jayaraman, state coordinator of Save Our Rice Campaign who strove hard for conservation of native paddy varieties for many years, passed away at a private hospital here on Thursday. He was fighting cancer for the past couple of years and recently admitted in a private hospital in Chennai. The end came at 5.20 am. He was 52 and is survived by his wife and a son. It will not be an exaggeration to say that Jayaraman had sacrificed his life protecting native paddy varieties for the future generations. Born in a poor agricultural family in Kattimedu village in Thiruvarur district, Jayaraman had studied only upto Class 9 and worked as a labourer in Thiruthuraipoodi. When he took part in the month-long awareness campaign on 'poisonless food', organised by his mentor, late Nammazhvar in 2003, farmers in some villages gave seeds of seven native varieties of paddy. Nammazhvar handed over those seeds and asked Jayaraman to cultivate them and conserve the seeds. This was the main motivation for Jayaraman's search for native paddy varieties. His popularity as a seed conservation activist is what earned him the nickname – Nel Jayaraman, (Nel means Paddy seed in Tamil). He was credited for redeemed 174 native varieties including Mappillai Samba, Rajamannar, Kavuni, Milagu Samba, Gundu Kar, Salem Samba, Sigappu Kuruvikar, Kallimadaiyaan, Samba Mochanam, Vadan Samba, Pichavaari, Navara and Neelan Samba. He has also established a research centre for native paddy varieties and organic farming at Adirangam village near Thiruthuraipoondi in Thiruvarur district. This centre has been guiding the farmers who wish to return to organic farming. Through this, Jayaraman had inducted over 37,000 farmers into organic farming and increased paddy production. In 2006, he launched Paddy Seed Festival and organised it in every May since then. Jayaraman would give two kg of seeds of native paddy varieties free of cost to each farmer with a condition that next year, at the same festival, the farmer should hand over four kgs of seeds to him so that the native variety seeds could be given to two more farmers. In 2011, he received the State Award for best organic farmer for his contribution to organic farming and in 2015, he received the National Award for best Genome Savior. He was officiated as a Training Director of a consumer-based organization called CREATE in Tamilnadu, which is a major partner in the Save our Rice Campaign. He has written books including Mamarunthagum Parampariya Nel (traditional paddy which has medicinal values), Nellathikaram and Nellukiraitha Neer. After public homage in Chennai, the body of Jayaraman was taken to his native village Kattimedu where final rites for his mortal remains would take place on Friday. It is a great hard work. He has not only saved the traditional verities Of padu but also culture and tradition of farmers also has been saved. A great man. Worked for saving and populating of parambariya varieties of paddy.